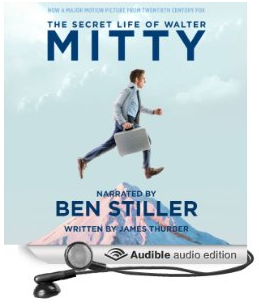 Amazon is giving away a free new audiobook edition of The Secret Life of Walter Mitty. It’s read by Ben Stiller, the star of the big Hollywood remake of the story that was just released in December. “Discover the story that inspired the film,” reads an announcement posted on the front page of Amazon — and it looks like the whole project was a labor of love. You can listen to it on any Kindle Fire tablet, or even on your smartphone, using Amazon’s “Audible” app. And I thought the audiobook was surprisingly effective, with Ben Stiller giving a thoughtful performance and showing some real affection for the characters. He not only starred in the new $90-million film — he was also the movie’s director. I wondered what it must’ve felt like to be involved in such an elaborate project that’s all about realizing your dreams – and you can tell from the audiobook that Stiller’s given this a lot of thought! He’s reading the very first version of this story by James Thurber, which appeared in The New Yorker in 1939. But it’s interesting to remember that Hollywood spent the last 20 years trying to create a worthwhile movie remake for this classic American short story. Steven Spielberg was interested in the project, according to Wikipedia, and so were other famous Hollywood directors like Ron Howard and Gore Verbinski. Actors considered for the lead included Jim Carrey, Mike Myers, Owen Wilson, and even Sacha Baron Cohen… But when all the dust had finally settled, it was Ben Stiller who was starring in the movie — and directing it. One of the most inspiring things about the movie was its artwork, and it’s nice to see it used as the icon for this audiobook. But there’s something special in this audiobook, as the narrator seems to show a special fondness for the same character that he’d played himself. It must’ve been fun to read, since you get to act out all the dialogue from Mitty’s elaborate fantasies. (Stiller delivers a good reading of the line “ta-pocketa-pocketa-pocketa….”) But as his voice changes to suggest the transition from daydream to reality, I also thought I detected some real affection for the gentle domestic moments of the 1939 couple. “Not too fast! You’re driving too fast,” says Mrs. Mitty. But whether you’re hearing the original story or watching the 2013 remake, the message is the same. A Kindle in Your Car Dashboard? It’s not as far-fetched as it seems. 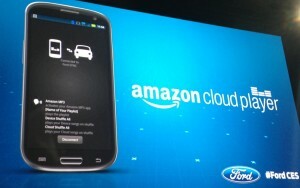 Less than two months ago, Amazon integrated its music-playing capability into the dashboards on new Ford cars. It’s the same “Amazon Cloud Player” technology that already lets your Kindle Fire tablet play any music purchased digitally from Amazon’s store. 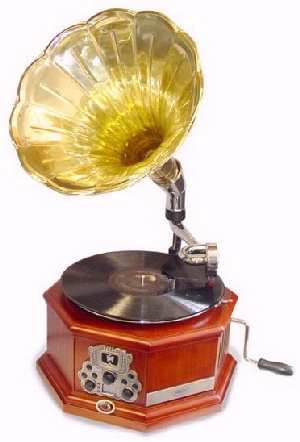 (And because the music is stored on Amazon’s servers, you can also listen to that same music through Amazon’s web site, as well as on their Amazon Mp3 smartphone apps.) “Recognizing that the car is a perfect vehicle for mobile apps, Ford launched a new developer program…” reported GigaOm in January, “and announced nine new smartphone apps for its Ford Sync platform.” Besides Amazon’s Cloud Player, the voice-controlled apps included three broadcast and internet radio services — Rhapsody, Aha Radio, and Greater Media — plus on-demand audio programming from The Wall Street Journal and USA Today, plus a selection of magazine articles from a service called Kaliki. Of course, no one should be reading ebooks while they’re driving, but Amazon is already well-positioned to deliver those same ebooks as audiobooks. They own Audible.com, of course, but more importantly, they’ve also introduced a special audiobook feature called WhisperSync for Voice. Now if you’re reading the text of an ebook on any Kindle, you can instantly switch over to its audiobook version in a Kindle app, and the audiobook’s narrator will continue reading right where you left off! Since Amazon has already created this service, “It would be cinch for Amazon to integrate that technology into the car,” writes the blogger at GigaOm. But the blogger also notes that Honda’s cars already include a library of audiobooks, and the automakers have been quick to add lots of other audio services to their “connected” car dashboards. So it may not be long before you really will start seeing a Kindle in your car dashboard. Last week I wrote about a new audiobook feature that Amazon introduced, making it easier to switch from the text version of an ebook to its professionally-narrated audiobook version. But in the same announcement, Amazon also revealed a new feature that’s available in its new versions of the Kindle Fire tablet. “Immersion Reading” promises “evolutionary multisensory reading experience that intensifies the power of great stories and helps readers retain more of what they read,” Amazon explains in a press release. Translation: you’ll be able to listen to a professionally-narrated audiobook at the same time that you’re also reading along with the text yourself! “Immersion Reading on the new Kindle Fire family sets a new standard for deep reading,” Amazon’s CEO explained in a press release, “by engaging the eye and the ear simultaneously with beautifully narrated audiobooks.” I was skeptical about audiobooks, until I heard some of the beautiful voices that the audibooks were using for reading the text. And “Immersion Reading” is now already available for nearly 15,000 different Kindle ebook/audiobook combinations, Amazon’s announced in their press release, “across a wide array of categories and genres.” It’s a feature that’s exclusively available on the new versions of their Kindle Fire tablets, and Amazon just revealed it in their September 6th press conference. And Amazon will let you try the feature with 20 free ebook/audiobook combinations of some classic books. They’re the same books I wrote about last week — some read by professional actors like Kenneth Branagh, Anne Hathaway, or David Hyde Pierce — at tinyurl.com/FreeKindleAudiobooks . In general if you see an ebook listed in the Kindle Store with “Whispersync for Voice” capabilities, you can also listen to its audiobook version while you follow along with the text for an “Immersion Reading” experience. There’s automatic page turns, and Amazon will even highlight the text as its being read, which they believe will offer offer a more compelling experience that helps both new readers and long-time fans of books. 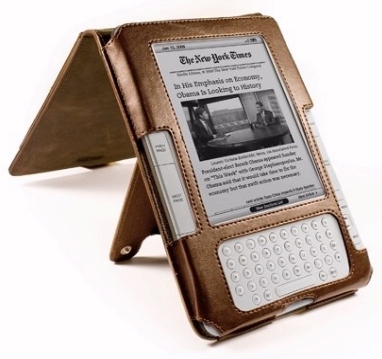 Unfortunately, you need one of the new Kindle Fire tablets to try out this capability. And the big 8.9-inch Kindle Fire HD won’t be shipping until November, though you can try it out now on the newest version of Amazon’s 7-inch Kindle Fire tablet (which is shipping now, and costs $159). 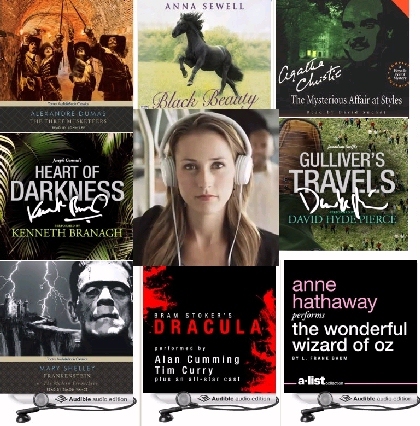 And you can still download the 20 audiobooks that Amazon’s giving away to encourage people to try out the new features. Judging by the footage I’ve seen of the new tablets in action, Amazon’s planning on putting a lot more focus onto audiobooks. On the main Home page of the new Kindle Fire HD, Amazon’s added a brand new choice to its menu at the top of the screen. Amazon Gives Away Free Audiobooks! And the readers for these books aren’t just professional audiobook narrators. Some of them are actually Hollywood movie actors! For example, the audiobook version of Heart of Darkness is performed by Kenneth Branagh, who’s been nominated for an Academy Award five different times. And there’s also an audiobook version of Agatha Christie’s first novel with her character Hercule Poirot — narrated by David Suchet, the actor who actually played Hercule Perot on public television’s Mystery Theatre! Amazon’s even giving away a free version of The Wonderful Wizard of Oz read by Anne Hathaway, an actress who’s appeared in everything from The Princess Diaries to The Devil Wears Prada. There’s also a free audiobook version of Gulliver’s Travels read by David Hyde Pierce, who’s won four Emmys for his performance as Niles Crane on the TV show Frasier. With Halloween coming up, you might also want to download the free audiobook version of Dracula by Bram Stoker. It’s read by a long list of narrators that includes Tim Curry — who played the lurking evil in the TV adaptation of Stephen King’s It, and starred as the crazed libertine scientist in the The Rocky Horror Picture Show. Why is Amazon doing this? To show off a brand new feature they’re making available for audiobooks that’s called “Whispersync for Voice”. Now if you’re reading the text of an ebook on any Kindle, you can instantly switch over to its audiobook version on your Kindle tablet (or in a Kindle app). And the audiobook’s narrator will continue reading right where you left off! “Most people I know believe that if they only had more time to read, they would be more imaginative, more interesting, and more successful,” the founder of Audible.com said in a press release. “Whispersync for Voice directly addresses that need. The ability to seamlessly switch back and forth between reading text on any Kindle and listening to the same title in audio on your smartphone [or on your Kindle Fire tablet]– and always pick up where you left off — means that the story can continue during those times of the day when you cannot look at a screen.” It’s a feature that’s exclusively available on the Kindle, with specially-enabled ebooks that are sold through Amazon’s Kindle Store. Below is a list of the 20 ebook/audiobook combinations which Amazon’s giving away for free “for a limited time.” Only 18 of them are listed at tinyurl.com/FreeKindleAudiobooks. The other two free combinations are The Picture of Dorian Gray by Oscar Wilde (narrated by Simon Prebble) and The Moonstone by Wilkie Collins (which T.S. Eliot described as “the first and greatest of English detective novels”). Amazon Books shared a surprising announcement this week. On Facebook, they’re publicizing the “5th Annual Tournament of Audiobooks!” It’s a head-to-head competition to determine which audiobook is the most popular — as determined by an online vote. 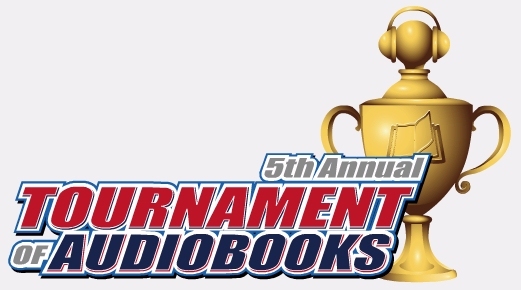 The tournament will be conducted by Audible.com — the audiobook service that Amazon purchased in 2008 — and they’ve structured the competition like the “March madness” playoffs…complete with brackets! You can check out all the action at audible.com/tournament — but Audible also shared a very interesting announcement about the 32 audiobooks. You can download their first chapters for free! 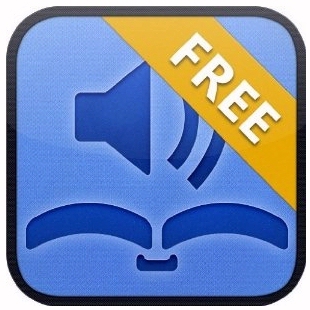 Free Audiobooks for your Kindle! In fact, they claim to be one of the world’s most prolific audiobook publisher, since every month they release up to 100 new audiobooks. The books are available in 33 different languages, and if you tried to listen to them all, one by one, it would take you a full 2 years and 251 days. “Our objective is to make all books in the public domain available, for free, in audio format on the internet,” they explain on their web site. And they’ve already recruited a community of thousands of talented volunteers who are working to make it happen. “We love reading, love books, love literature…” explains one page, and it adds that they “think the public domain should be defended and enriched, we like free stuff, we like to hear people read to us, and we like reading to other people.” Even though there’s already millions of free e-books available in the public domain, the site’s creators firmly believe that there should also be a free audiobook version for every single one of those e-books. And it’s an inspiring vision which makes me want to wish them all luck. I’m not the only one who’s a fan of the site. One of the top free apps in Amazon’s new app store (for Android smartphones and tablets) is an audiobook apps from travelingclassics.com. And it gives you easy access to all of the LibriVox audiobooks, plus specially-edited versions of the audiobooks as well as professionally narrated and recorded titles. If you don’t feel like listening to audiobooks on your Kindle, you can also try installing them on your smartphone. I enjoyed reading the app’s web page, just to read comments from other fans of the audiobook files. There was someone who was already on chapter 44 of a novel by Charles Dickens — and another who was listening to a reading of the original horror book Frankenstein by Mary Shelley. I’ve been reading the literary children’s classic, The Wind in the Willows, and I was delighted to discover that there were three different versions! I’ve enjoyed using the text-to-speech option on my Kindle — but this offers a nice twist. Now I’m actually hearing the same books being read by a live narrator! and leave my Kindle in the passenger seat to read to me. And at least one blogger hints that it makes you feel like you’re part of an invisible community. Amazon adds Audio Books to the Kindle Store! A few minutes ago, Amazon made a big announcement. If you point your Kindle 3 to Amazon’s Kindle store, you’ll now see a new link at the top of the page — “Audible Audiobooks”. Amazon will now wirelessly deliver audio books — read by a human voice — directly to your Kindle 3 over a Wi-Fi connection! You can now purchase these audiobooks right there on your Kindle, including 3,747 mystery/thriller books, 5,255 children’s books, and 14,449 works of fiction. “We’re very excited to announce that more than 50,000 Audible Audiobooks are now available for purchase or download on the latest Kindle via Wi-Fi delivery,” Amazon posted in the Kindle’s discussion forum at Amazon.com. And they’ll give you two free audio books — the digital version of a “book on tape” — if you sign up for a 30-day free trial! It’s always been an intriguing way to use your Kindle, and Amazon’s new policy should make it much easier to enjoy a new audio book. Prior to today, “you had to transfer it,” an Audible representative told me this morning. You’d use your web browser to download the audio book to your computer’s hard drive — and then you’d have to connect your USB cable to your Kindle, and manually upload the audio book. I was surprised by the selection of audio books that are now available. There’s even an audio version of “Pride and Prejudice and Zombies” and several books which are actually read to you by their author, including two by Jon Stewart and Donald Rumsfeld’s “Known and Unknown.” For the next three months, they’ll let new customers explore Audible’s service at a lower monthly subscription price — just $7.49 a month. (After three months, the cost of the subscription increases to $14.95.) These subscribers get one free audio book each month, plus a 30% discount on any subsequent audiobook purchase. And they’re even throwing in a free daily subscription to audio versions of The New York Times or The Wall Street Journal. The news created a small frenzy of excitement. (Within an hour more than 250 people had clicked the announcement’s “Like” icon.) And it’s been really fun to read the real-time reactions from Kindle owners. “isn’t the term ‘audible audiobook’ redundant?” someone asked — before being reminded that Audible is the name of the web site! But another user posted enthusiastically that “That is awesome I have been waiting for this option.